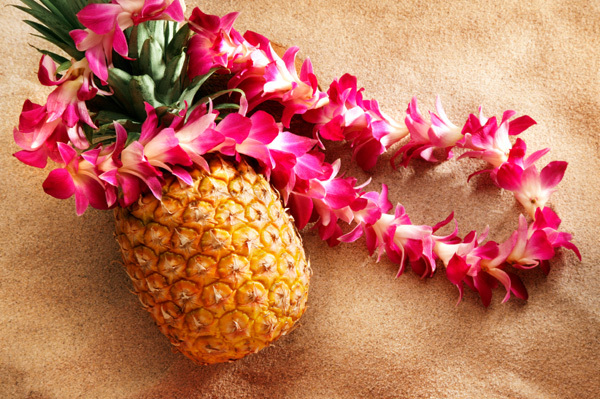 You may not be able to hop on a plane to Hawaii this summer, but that doesn’t mean you can’t treat your kids to a Hawaiian-themed craft day. Follow these quick steps to create paper leis — then turn on some music and enjoy hula dancing around the house with your kids. Luckily, you don’t need much to create paper leis, and you can be flexible if you don’t have a particular item on hand. Start with the following supplies, but allow yourself to think creatively as you put your crafting skills to work. Trace flowers onto your construction paper or use your floral hole punch to punch out a number of flowers. If you’re drawing flowers, you can trace a printable floral pattern to create identical flowers, or you can freehand the design for a more unique approach. Once you’ve drawn your flowers (you’ll need approximately 20 flowers per lei), cut them out and use the one-hole punch to punch holes in the center of each flower. If you’d like, this is the point where you can add glitter, paint and other decorations to the flowers. If you decide to go this route, make sure you allow the paint and glue to dry completely before continuing. String a single flower onto the yarn and follow it by a single piece of straw. Continue alternating between flowers and straws until the yarn is completely full, leaving just enough room at the ends to tie the necklace. Loop the lei over your child’s head and knot the ends together. While the craft is sure to get your kids excited, give them an full Hawaiian experience by turning on Hawaiian music and serving up kid-friendly versions of traditional Hawaiian fare. Slices of pineapple and mango, pulled pork sandwiches and sweet potato fries are all sure to do the trick.